Unfortunately, the field was muddy and it was raining all day. We all had a go on the segway (which took ages!) and then were put into teams and completed tasks going round cones and throwing balls. Obviously, my team won overall! It was really good fun, and really easy. Even my Mum did it and she's 65. She was very nervous but soon got the hang of it. They're sturdy little machines. 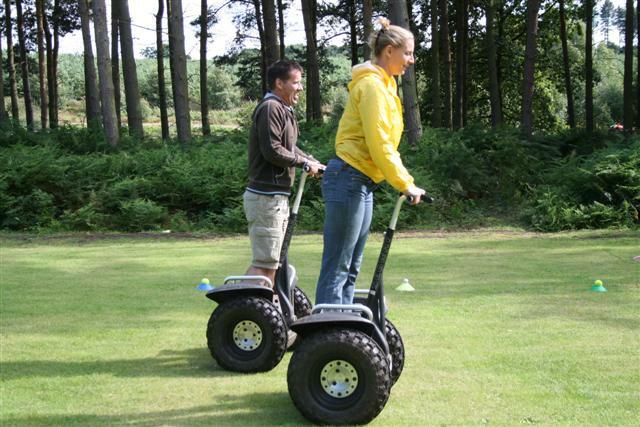 You stand on them and they stay still, but then if you start leaning forward the segway will move forward. The more you lean, the faster it goes. It also goes backwards if you lean back. You change direction by moving the handle from side to side. They're really responsive and comfortable to ride, but also would be difficult to fall off or go too fast. So, if you are having a hen do, or just want to try something new, I would definitely recommend doing a segway experience. I would possibly advise that it wasn't raining, as it did put a damper on the day (no pun intended!). If you do have a go, let me know how it was!